Viral Shocking Messages Facts/Fake on Social Media: Whatsapp, facebook etc. Viral Sach: Are apples coated with some kind of polish to give them a shiny look? Headings are similar or different ! Dubai Mall incident. Mobile explode while charging through PowerBank inside pocket. In a terrifying video that was said to have happened in Dubai, a man can be seen trying to escape the fire that caught his clothes in a mall. But, as it turns out, the news is fake. A video of a man engulfed in fire creating havoc inside a mall in Dubai went viral on social media recently. According to Faisal Cp Kuttammakkal, who shared the video on Facebook — the fire was the result of the man’s mobile exploding inside his pocket. With over a hundred shares in less than 24 hours, the short clip, the caption of which in Malayalam translated to “an incident that just happened in Dubai”, had gone viral. Many can be seen trying to douse the fire with clothes and shrieking in fear. But as it turns out, the news is fake. According to a report by Gulf News, Dubai Police warned people not to believe everything they see, explaining that the accident apparently happened in Morocco, in a city called Agadir, on June 3. “The video wasn’t in The Dubai Mall or in any mall in the emirate. There is a police post in the mall and the officers didn’t receive any alert about such an incident,” Major-General Khalil Ebrahim Al Mansouri, Assistant Commander-in-Chief for Criminal Investigation Affairs of Dubai Police, said. According to a report by BOOM, Dubai Police also posted a clarification on their Twitter account, refuting the rumours that the horrifying incident took place in a mall there. A Morocco World News report stated that the man was in fact, a ‘would-be shoplifter’, who set himself on fire at the Agadir supermarket. The 30-year-old decided to do this because his attempt at stealing something from the mall was foiled by the security personnel there, who then imposed a heavy fine. Is This Video of a Man Falling Down a Flight of Stairs Real? A video shows a man surviving a tumble down a long flight of stairs, only to be hit by a car in the street. A number of theories have been posited over the years about a decade-old video depicting a man falling down a long flight of hard steps, only to be struck by a car when he reaches the bottom. (Don’t worry, he’s shown afterward walking away as if nothing happened.) Was is created using CGI? Does it show a stuntman performing a trick? Was the man drunk and therefore impervious to the multiple painful blows he undoubtedly received? Most important, does this video truly a capture man tumbling down a long set of hard steps and being struck by a car at the end, yet incredibly surviving that entire ordeal with no apparent injury? Fortunately, a much clearer version of this clip exists online. The conceit of this video is that the spectacular accident was coincidentally caught on camera by someone coincidentally present who was simply trying shoot some video of his wife and children, yet that unseen videographer somehow managed to keep unexpected events perfectly centered in his camera at all times, as if he somehow knew that a man would just happen to fall off a ladder to the ground, successively tumble down several flights of steps, and be struck by a car in the street at the end before walking away. The camera never jitters, shakes, or goes out of focus throughout the entire clip, nor does the man experiencing the prolonged “accident” ever come close to going out of frame. Fernando Luz, an advertising copywriter, posted about this video shortly after it first appeared online back in 2008. Luz reported that it was created for a Levi’s Jeans commercial by the production company Anonymous Content, with visual effects by MiniVegas. We’ve reached out to Seymour, a music video director whose film reel features a number of special effects but did not hear back by press time. We’ve also reached out to both MiniVegas and Anonymous Content for more information about this advertisement. FACT CHECK: Is This Video of a Man Falling Down a Flight of Stairs Real? Video: Invincible Man Falling Down Stairs. 2. Drunken man falling down stairs. This is an old video that has been circulating for many years. It supposedly shows a man falling down from a building top, rolling down a long staircase on to the main road, and then being run over by a car. Unbelievably, the man simply wakes up and walks away, as if nothing ever happened to him. This video looked so convincing that most people thought it was an accident of a drunk man, who is probably exceptionally strong. However, it was nothing like that, the video is NOT real. The first versions of this video was uploaded to YouTube in April 2009, with a title “Invincible Man Falling Down Stairs. Fake?” – in Comedy section. Few viewers who did not notice this thought that the man was either badly drunk, or it was a sequence of a professional stuntman. The fact is a bit more than that actually. The video is a result of stunt sequences of a professional followed by clever editing using CGI. Professional stuntmen like the guy in the video can in fact do such amazing stunts. Watch the above video as an example. The stuntmen, in most cases, also use safety tricks like padding the stairs with some kind of rubber layer. As far as this video is concerned, the man who initially falls from the roof of the building appears like a doll, which is followed by a sequence of stunts, and then at the end, again a doll is likely to have been used to show up a real car hit. All this is actually staged, shot in sequences and later made into a so called unbelievable stunt – with the help of CGI. The blurry film is itself the proof of it. So the video of this so called invincible man falling down from a building roof, and then down the stairs onto the main road, only to be run over by a car is a hoax. No ordinary person can survive such an accident without being hurt at all. The video is most certainly made for the sake of fun. Readers are warned not to try any such stunt though. The Picture of the Century: Eagle Catching a Drone! 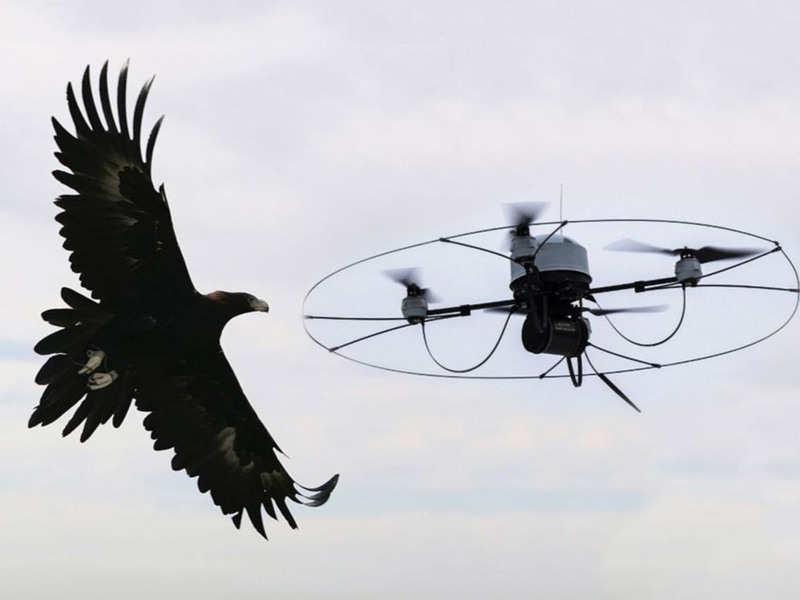 An interesting picture in wide circulation online purports to show how an Eagle Catches a Drone in mid-air Sky. Social media users shared it widely as the picture of the century where Nature defeats Technology. However, many viewers wondered whether the picture is real, graphics or just a photoshop creation. The picture showing Eagle Catches a Drone is real but comes from a slightly different context than what is described as a natural incident. What you see in the picture is in fact a trained Eagle during a Police exercise in Katwijk, Netherlands back on 7th March 2016. The Bald Eagle, belonging to a Denmark-based raptor-training security firm Guard from Above, takes down a drone. The same picture appears on Getty Images website gettyimages.in. The trained birds of prey catch the flying drones with legs and bring them down to ground. The drones are presented to the birds as a potential meal; they are rewarded with a piece of meat after each successful foray. The innovative idea of training Eagles to catch flying Drones came up in response to growing concerns about “hostile drones”. 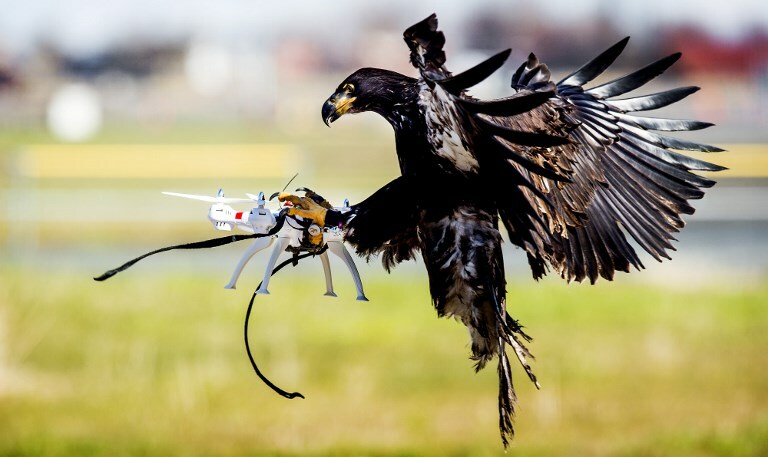 The Dutch Police were planning to use the trained Eagles to remove unlicensed drones and others that pose a public safety threat. A Netherlands’ National Police official described it as a ‘low-tech solution to a high-tech problem‘. The video below shows a news report on the Dutch Police Department’s innovative concept. After the Dutch trials, even London looked into the prospects of using Eagles to take down “hostile drones”. On the other hand, the idea of using Eagles to intercept the unmanned aircrafts (Drones) garnered some criticism. Animal lovers and related organization officials expressed some concerns. They say Eagles are big and powerful birds, which should not be flown in built-up areas. They also expressed concern about the animals’ welfare, the safety of the bird. The flying drones usually have four rotating blades, which can cause harm to the Eagles, they say. The company officials, however, say the Eagles have the natural skill to catch drone-like preys without harming themselves. Fact with some missing information. People in India can submit misinformation or rumours they receive to the Checkpoint Tipline on WhatsApp (+91-9643-000-888). NEW DELHI: WhatsApp Tuesday unveiled its 'Checkpoint Tipline', where people can check the authenticity of information received as the messaging giant looks to crack down on fake news ahead of the general election in the country. "Launched by PROTO, an India-based media skilling startup, this tipline will help create a database of rumours to study misinformation during elections for Checkpoint - a research project commissioned and technically assisted by WhatsApp," the Facebook-owned company said in a statement. It added that starting Tuesday, people in India can submit misinformation or rumours they receive to the Checkpoint Tipline on WhatsApp (+91-9643-000-888). Once a WhatsApp user shares a suspicious message with the tipline, PROTO's verification centre will seek to respond and inform the user if the claim made in a message shared is verified or not. "The response will indicate if the information is classified as true, false, misleading, disputed or out of scope and include any other related information that is available," the statement said. This centre is equipped to review content in the form of pictures, video links or text and will cover English and four regional languages - Hindi, Telugu, Bengali and Malayalam. PROTO will also look at working with organisations at grassroots level to submit misinformation circulating across different regions in India during the election period. Facebook, which counts India as one of its largest markets with over 200 million users, had faced flak from the Indian government after a series of mob-lynching incidents, triggered by rumours circulating on WhatsApp, claimed lives last year. Under pressure to stop rumours and fake news, WhatsApp had last year restricted forwarding messages to five chats at once. It has also been putting out advertisements in newspapers and running television and radio campaigns offering tips to users on how to spot misinformation. Interestingly, the Indian government, through proposed changes in IT rules is seeking to make social media platforms more accountable by mandating them to introduce tools that can identify and disable "unlawful content". One of the amendments being mulled in the IT intermediary rules (meant for online and social media platforms) will require them to enable tracing out of such originators of information as needed by government agencies that are legally authorised. However, WhatsApp has so far resisted the government's demand for identifying message originators, arguing that such a move would undermine the end-to-end encryption and the private nature of the platform, creating a potential for serious misuse. In its statement on Tuesday, WhatsApp said Dig Deeper Media and Meedan - which have previously worked on misinformation-related projects around the world - are helping PROTO to develop the verification and research frameworks for India. Meedan has developed the technology to support the verification of rumours and will maintain the database of such content that have been processed. To do so, they have expanded their check platform (developed for recent elections in Mexico and France) and integrated it with the WhatsApp Business API, to receive and respond to messages at scale. "The goal of this project is to study the misinformation phenomenon at scale, natively in WhatsApp. As more data flows in, we will be able to identify the most susceptible or affected issues, locations, languages, regions, and more," PROTO founders Ritvvij Parrikh and Nasr ul Hadi said. The verification reports PROTO sends back will encourage grassroots-level "listening posts" to send more signals for analysis, they added. Following the project, PROTO also plans to submit learnings to the International Center for Journalists to help other organisations learn from the design and operations of this project. "The research from this initiative will help create a global benchmark for those wishing to tackle misinformation in their own markets," Fergus Bell, founder and CEO, Dig Deeper Media, said. NEW DELHI: On Monday, social media giant Facebook removed 687 pages and accounts with alleged links to the Congress IT cell for “engaging in coordinated inauthentic behaviour”. BJP used the announcement to attack Congress for spreading “fake news”. Congress, meanwhile, denied that the suspended pages and accounts were linked to the party. Inauthentic behaviour, the social media company explains in a December 2018 blog post, is using fake accounts to disseminate content and increase engagement on someone’s own pages. “While the people behind this activity attempted to conceal their identities, our review found that it was connected to individuals associated with an INC IT cell,” Facebook posted. Those handling the suspended accounts (549) and suspended pages (138) had spent $39,000 (about Rs 27 lakh in current exchange rate) for ads on Facebook. Congress denied any link to the suspended accounts and pages with a tweet. “This is to clarify no official pages run by INC have been taken down. Additionally, all pages run by our verified volunteers are also unaffected. In the meantime, we are awaiting a response from Facebook to provide us a list of all pages/accounts that they have taken down,” the party tweeted. BJP, however, attacked Congress for spreading “fake news”. Facebook also removed 15 pages, groups and accounts linked to individuals associated with an Indian IT firm, Silver Touch, for similar behaviour. This Ahmedabad-based company had spent $70,000, or about Rs 48 lakh, on ads. Asked what Silver Touch’s link with politics was, Facebook’s head of cybersecurity policy, Nathaniel Gleicher, told Reuters earlier it was “associated with” a mobile app promoted by the Bharatiya Janata Party (BJP). After BJP’s IT head, Amit Malviya, told Reuters both the party and the app had “nothing to do with Silver Touch”, Facebook in a new statement late on Monday said it had “seen no evidence to date of Silver Touch being associated with the NaMo App on our platform,” referring to the Narendra Modi app. “We won’t be speculating about off-platform connections of the actors we took down today,” a spokeswoman said. Facebook’s actions on Monday also included the removal of a “pro-BJP” page called “The India Eye”, which had more than 2 million followers, “was strongly nationalist”, a vocal supporter of Modi and a critic of Gandhi, Atlantic Council said. The Money spent on advertisement is much more by BJP as seen in statistics. But the real money spent in disguise is much more to spread hatred among common man in name of religion, faiths, nationality etc. No Ruling Party / Political Party has spent any money on Humanity, Good Faith, Help / Support to poor or needy etc. This is the responsibility of Some Religious Organisations / NGOs / Individuals only.